Today is the last day of 2008. From 0001hrs, 2008 will be Ex! 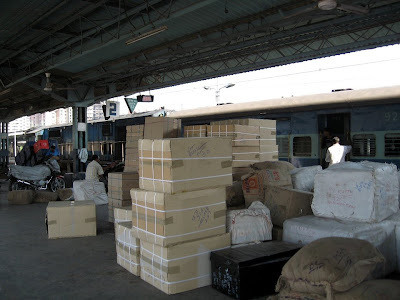 Freight piled up for loading in the Freight carriage of the passenger train at Kurla Terminus. Spidey getting ready for a night out in Mumbai!! 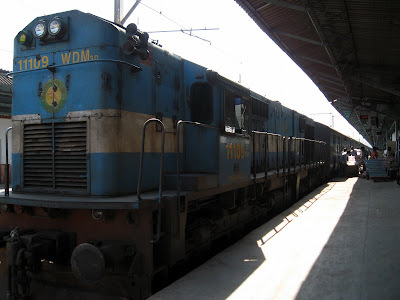 A Diesel Engine waiting to pull the train to its destination - Mangalore (South India) -from Kurla station in Mumbai. This train will travel along the picturesque Konkan coast. No, I am not travelling in the train pictured above. Cheers! Happy Holidays to everyone!! 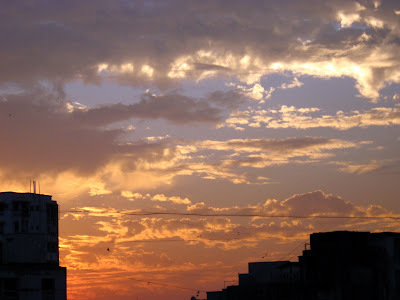 The Mumbai sky on 12Dec08 at 1729hrs. 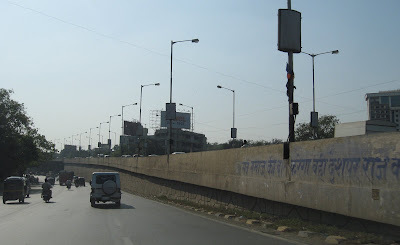 This is the path or road to enter Mumbai city from the Eastern Suburb of Sion. 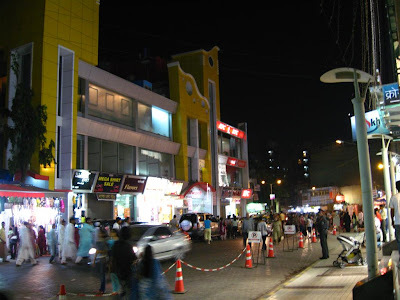 Sion is the 1st suburb on the Eastern side of Mumbai. West is where the sun sets. 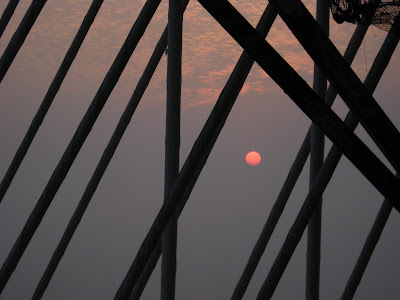 This is the view of the setting sun over the Western coast of Mumbai from atop the Bandra Worli Sealink. 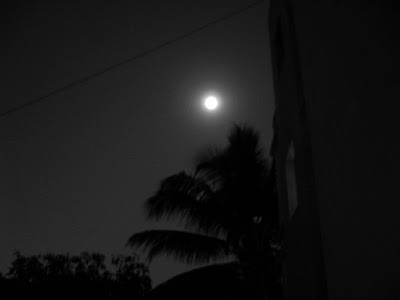 This is how the moon was on 12Dec08 in Mumbai - the day that the moon was the closest to earth! Although a full moon happens every month, the one that rises on 12Dec08 will appear about 30 percent brighter and 14 percent larger than the other full moons seen so far this year. That's because our cosmic neighbor will be much closer than usual. The moon will be at its closest perigee—the nearest it gets to Earth during its egg-shaped orbit around our planet. 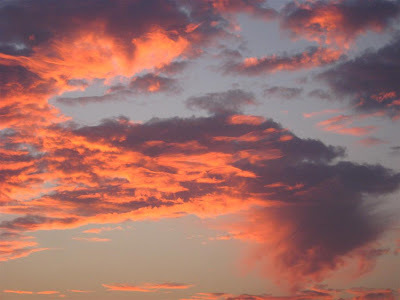 Flaming skies of Mumbai as seen on 07Dec08 at 1810hrs. Quiet are the Mumbai skies at dawn. 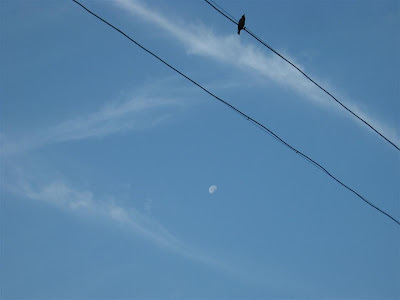 The moon still shines and the bird still resting. Peace reigns. Here's wishing peace and quiet to the world! This is a common sight on our streets in the suburbs. The Variety of Vehicles is always diverse. 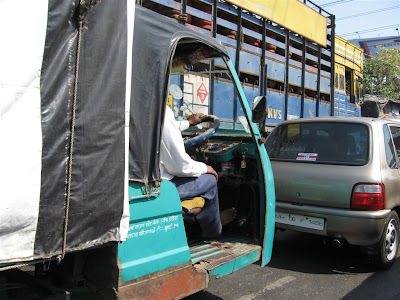 Like in the above picture there is a 3 wheeler cargo transporter overshadowed by a 6wheeler cargo transporter and cowering ahead is a 4wheeler passenger vehicle! Mumbai - That's my world! This is a view of part of Bandra in Mumbai from atop the Tower of the Bandra-Worli sealink that should be ready by March09. This is my world which is expanding, charting new territories, building bridges towards development and a better future for all. 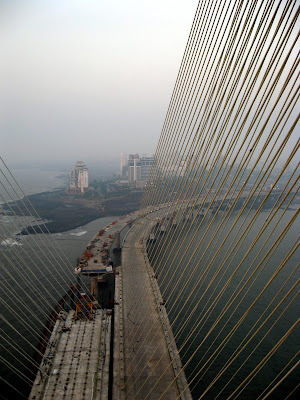 To know how I got this high please see the post 'Atop the Bandra-Worli Sealink', a couple of posts below. 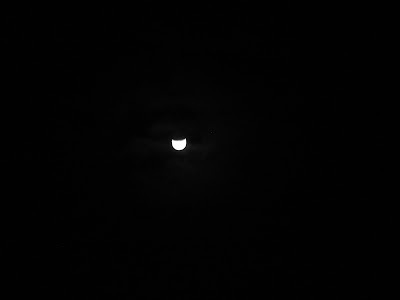 The Mumbai moon on 10dec08 at 1928hrs. Apparently the moon was closest to earth on 12dec08. 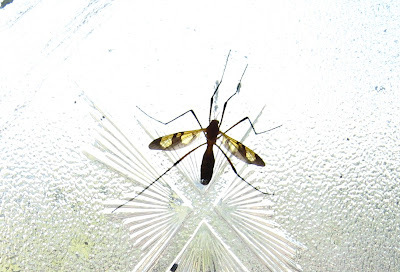 This trim and fit insect wished to feature in the Camera Critters meme. I obliged. Click on the picture to enjoy an enlarged view. Radio One, Mumbai a very popular FM radio channel, whose tagline reads - One Spirit One Mumbai, yesterday invited a few of its regular listeners to visit the soon to be opened Bandra-Worli Sealink that is going to be one of the most visited icons of Mumbai like the Sydney Harbor Bridge (Australia), San Fransico's Golden Gate Bridge (USA) or the London Bridge (UK). I was one of the lucky few to be invited for the preview. In the bottom left frame is Mr.Jimmy Mogal, Vice President, Corporate Communications of HCC (Hindustan Construction Co.Ltd), giving us the low down on the project. The frame at the bottom centre is the group with the Cable stayed Towers in the background. 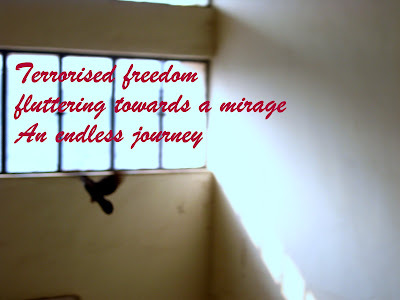 We were taken in a caged elevator up the central column that you can see inbetween the towers to a height of 100metres. The height of the towers is 126metres. In the extreme right bottom frame is Kunal who fulfilled his dream of fluttering our national flag at the top of the Tower. 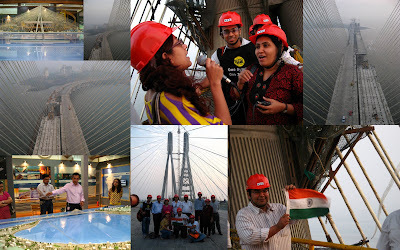 At the top left is the model of the cable stayed part of the bridge and in between the awesome views from the top is the most famous Radio Jockey of Mumbai from Radio One - Tarana along with Aniruddh and Annie, broadcasting live from the top of the Tower - another first for Radio One! This visit, with the assistance of HCC, was hosted by Radio One to strengthen the sense of pride and belonging among the Mumbaikars during these troubled times that our city has been going through. 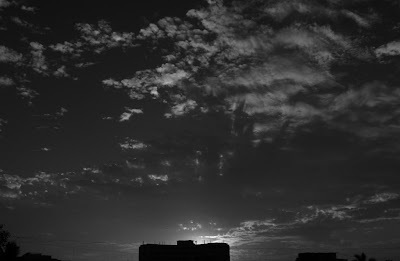 The Mumbai sky as seen on 07Dec08 at 1749hrs. Perenially Bright shopping lights here - off Linking Road (a shoppers heaven) in Bandra,Mumbai. However the crowds on this day are much subdued due to the recent terrorist attacks. Took this picture on 09Dec08 which was celebrated as Bakri (goat) Eid by the Muslims. On this day they sacricifice goats, cook delicious Mutton Biryani and come out shopping and greeting. 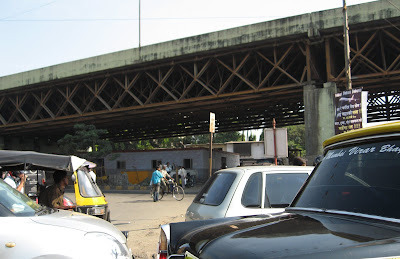 Under the flyover at Ghatkopar, central suburb of Mumbai. 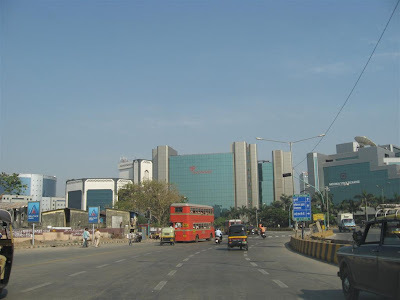 This is the Bandra Kurla Complex in Mumbai. This area is being developed as an alternate to the Central Business District at Nariman Point in South Mumbai as it is getting too congested. Quite a few Corporates have shifted their offices here leading to a boom in real estate in this area which is actually reclaimed from the creek. 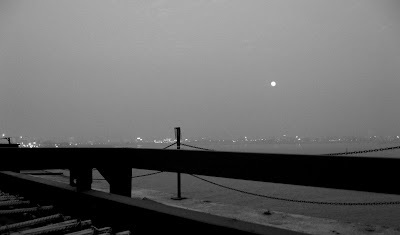 Dramatic monochromatic evening in Mumbai. 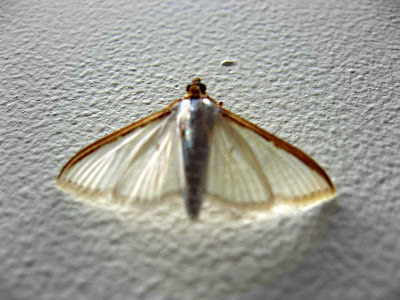 A beautiful creature that flew in for a short visit. 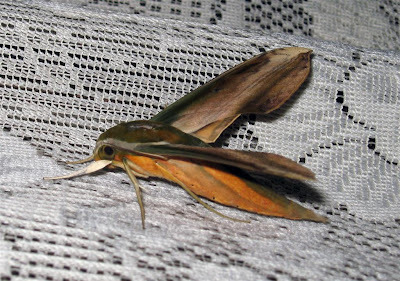 Can someone identify it please. 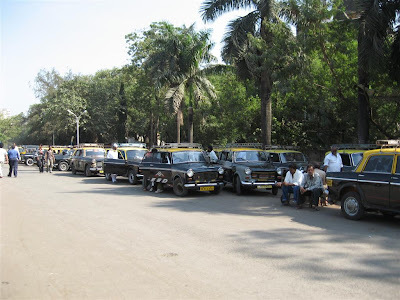 All these are vintage taxis (indigenised Fiats more than 25yrs old) waiting outside Lokmanya Tilak Railway Terminus at Kurla, to take arriving passengers to various destination in Mumbai. As per the new edict from the Government, most of these taxis will be scrapped as of 04Dec08. This may possibly be the last run for them. The drivers/owners have been promised assistance in getting new models to be operated as taxis in a move to reduce air pollution in the city. 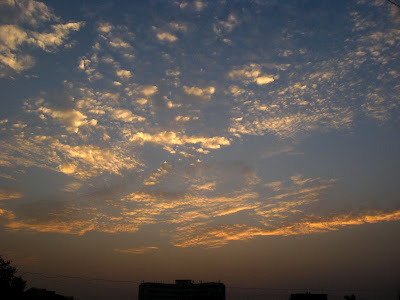 The Mumbai sky on 04Dec08 at 1757hrs. 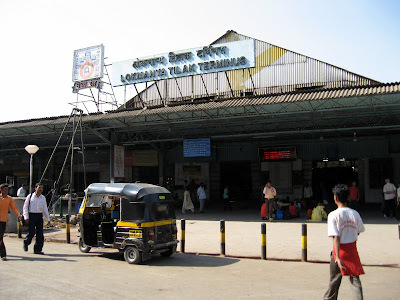 This the Lokmanya Tilak Train Terminus at Kurla in the Central suburbs of Mumbai. It caters mainly to Inter State Railway Traffic to and from the Central and Southern States of India. This is during lean hours, otherwise it is full of people, either coming or going! Tails of aircrafts at Mumbai airport. The Heavens watching the goings on in Mumbai on 01Dec08 at 1837hrs. 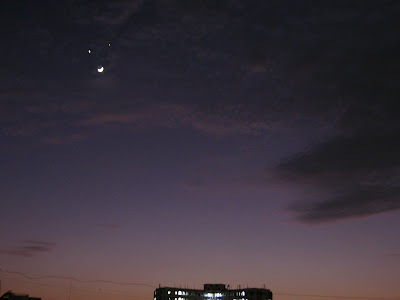 This was due to the unique positioning of the moon with Venus and Jupiter. 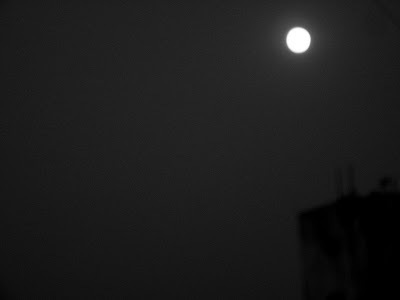 The full moon in Mumbai as on 14nov08 monochromatically!